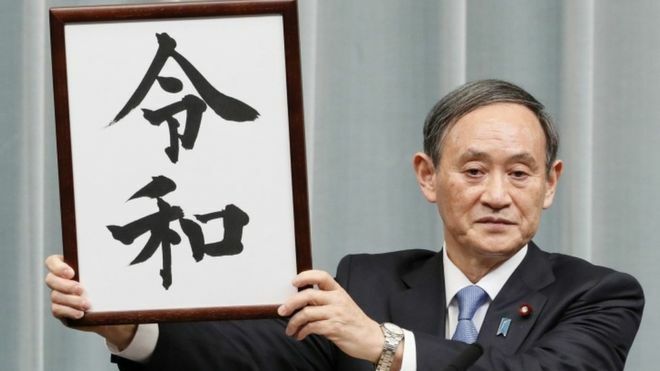 Japan has announced that the name of its new imperial era, set to begin on 1 May, will be "Reiwa" - signifying order and harmony, BBC reported. The term for the new era is made up of the two characters Rei and Wa meaning "order" or "command", and "peace" or "harmony". He explained the Manyoshu symbolised Japan's "profound public culture and long tradition". "Our nation is facing up to a big turning point, but there are lots of Japanese values that shouldn't fade away," Mr Abe told reporters. There have been only four eras in Japan's modern history: Emperor Akihito's current Heisei era which means "achieving peace" was preceded by the Showa era (1926-1989) which can be translated as "enlightened harmony". Before that, the Taisho era (1912-1926) meant "great righteousness" while the Meiji gengo (1868-1912) meant "enlightened rule" in English. Each gengo's name aims to set the tone for the upcoming decades, and remains significant to most Japanese in their daily life. Monday's unveiling of the era name follows weeks of speculation and top-secret cabinet discussions and the winning term was eventually chosen by cabinet from a selection drawn up by a panel of scholars and experts. Japan's government confirmed in December 2017 that the current emperor, 85-year old Akihito, would abdicate in April 2019 due to old age and hand the throne to his son, Crown Prince Naruhito.